This post begins my series of reviews of comics I picked up (bought or traded for) at the SPACE con in Columbus last weekend. There will be more to come in later weeks. Wonka Wonka Kochalka is a tale in Max Ink’s “Blink” series. Specifically it is part of a multi-chapter saga titled “So it Goes”. Blink is the name of one of the characters. It’s a nickname. (Her real name is Merle, hence the use of the nickname.) Anyway, the series is about three twenty-something friends and their lives and conversations in Columbus. It’s a very sweet, thoughtful series. There’s no strangeness such as zombies or mutants or anything that’s usually associated with comic books. It’s just a story about some people’s lives. It’s a very well told and excellently crafted series. Truth is, I absolutely love Max’s ink work. His drawings are amazing! He does amazingly detailed backgrounds and excellent character expressions. 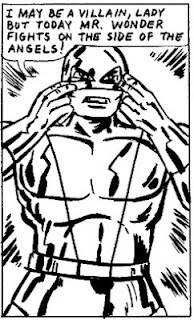 My goal in doing these reviews of small press comics is not to compare them to each other, but I will say out of everyone at SPACE, I think Max and Blink are most deserving of some real attention in the comics fan world. This is great stuff! And I should add, Max now ties with Jason Leaver (writer/director of the webseries Out With Dad) for the best use of the word “awesomesauce” in a dramatic work. 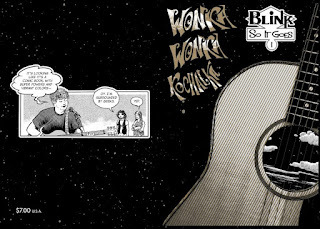 This particular story tells of Blink and her friend Sam going to see their other friend Hank play guitar and sing at a small venue. There they meet a few of Hanks friends, who are a rather geeky bunch. Sam is rather antagonistic towards the other, perhaps seeing Hank as a force that may interfere with Blink and her friendship. No real resolution in this tale, but a nice ending nevertheless. Find out more about Blink and Max’s art at his website. 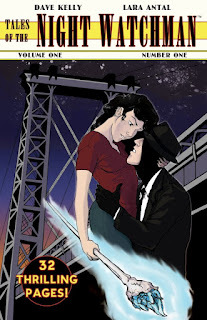 Tales of the Night Watchman Vol1 No 1, “The Long Fall” by Dave Kelly and Lara Antal. 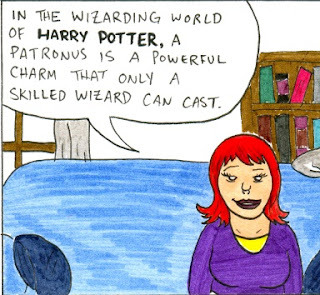 This comic proves that there are still fresh ideas in the “super-powers” genre. The Night Watchman is a time displaced zombie-fighter who also works at a coffee shop with his roommate (but not romantic partner—at least not yet!) Nora. Nora can get a little annoyed when she’s left fending for herself while Charlie (the Watchman’s real name) is off doing his heroic duty. This issue sets up some future storylines, including a look into Charlie’s dreams and past, introducing a boy thief and the mystery of a murdered woman. I like the plots and the characters. The art is a bit cartoony but clear, except for some perspective issues—which is something every artist should think about working on! Dave and Lara have a website here where you can find out more about the Night Watchman! Homegrown Alien Minicomic by Joe Davidson. This is the story of a plant and his friend. 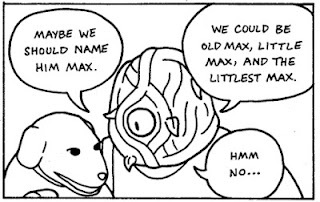 Specifically, Little Max was an alien seed that took human form after being found by Old Max, a drifter. The two travel about the country finding adventures on Joe’s website. 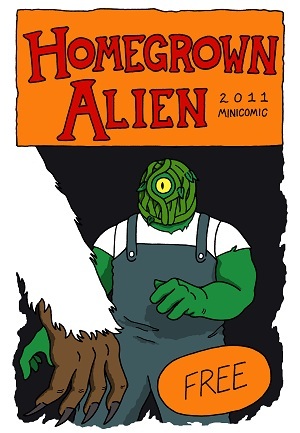 The minicomic I got at SPACE was a free introduction to Homegrown Alien and a very nice tale about a monster hunter looking for a lost Yeti. Joe’s art is nice and clean with a style I like very much, and his writing is great! I’ve enjoyed all the Homegrown Alien stories I’ve read so far, and I have a lot to go through on his website! And that’s it for reviews this week! I don’t know what exactly I’ll have up next time, so just keep checking back, okay? 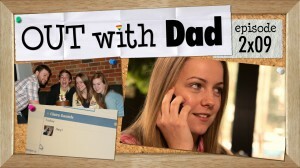 This is my blog entry to review the latest episodes of Out With Dad. I expected to get the review for episode 2.08 done before 2.09 was released, but 2.09 got released a bit early and I’ve been busy reviewing small press comics. So allow me to digress a bit first. Small Press comics are to mainstream comics what web series are to television series. It’s something I discussed last year in this blog entry. So, if you come to my blog looking for my commentary on comics, I suggest you spend some time checking out a web series, such as Out With Dad. If you come here looking for my commentary on Out With Dad I invite you to check out some small press comics, like the SPACE Anthology you can find for free here! Though it was originally my intent to discuss episode 2.08 of Out With Dad on this post, I find it impossible to think about ep. 2.08 without thinking about ep. 2.09 also. There’s just so much in both about Claire, everyone’s favorite new character. So this review is just going to have to discuss both episodes together. Now—on with it!! Maureen’s story reminded me of something I was commenting on recently (here), about how someone’s life can take a very tragic turn when there’s a lack of support from family. And knowing this is not a fictional account, but rather a dramatization of a true account shared by a viewer makes it even more tragic. I’d like to especially thank the people who were willing to submit such stories. I know that if they affect me so much, they must really mean a lot to people who are going through situations like the characters in this drama. It was nice to hear a light story like David’s. I think for every person who treats someone badly because of their sexuality there are many more of us who treat such persons as we would anyone else: with dignity and respect. Rose was true to character, with her hesitancy to speak. Nathan was excellent, saying all the things he needed to say (though I keep thinking he still needs to tell his daughter he’s dating!). When Rose did speak, her words were profound. Her desire to put the Genie back in the bottle is sad but understandable. The portrayals by the actors in this episode were fantastic. Just fantastic! Chatting with Claire was a lighter episode, but still very compelling. As I’ve noted before, my favorite thing about this series is how it makes me think about things. It’s amazing how much a little 7-minute story had me thinking! The details put into this little episode with very little spoken dialogue and only one character present are amazing! And I’m not just talking about the cameos by other Toronto web series on the Facebook page! The little things like Rose deleting half of what she types while Claire types away then apologizes for what she has said are the little things that make this show so engaging. Even Rose’s hesitancy when befriending Claire is so spot on and so well acted by Kate Conway! I love the focus on her wringing hands. Allow me to digress a bit while I gush about how well Kate does in this episode with very little actual dialogue! You can see everything Rose is thinking and feeling! Just a wonderful job! I even think it’s worth mentioning that many times in movies and television when a character types the character says aloud what they are typing. Director Jason Leaver doesn’t use this convention, though, and I think the episode is more realistic and dramatic because of it. The two main plot threads of this episode are setting up the trip to the museum next episode and Rose’s Facebook information. Claire notices that Rose’s info says Rose is interested in men. Certainly something Rose entered before she realized her own sexuality. In the end Rose decides not to mention who she’s interested in. I like her decision. I don’t see a reason for her to have to be public with such information. In conclusion, both episodes were great! I’m really looking forward to the next episode, coming May 3rd! The show is wonderful. In fact, It’s totally….dare I say it?? 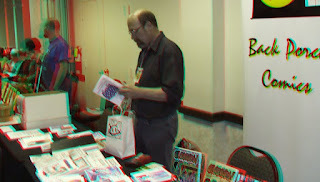 I spent the weekend in Columbus at the 2012 SPACE convention. SPACE is always a wonderful experience for me for several reasons. It’s nice to be away from the mainstream comics and hype of most major cons. Though media guests and previews of the next big movie can be fun, it’s nice to see a group of "small-time" artists and creators who are there to promote their latest artistic endeavors. The comics and other art at SPACE are great examples of "labors of love", and that makes them extra cool! The atmosphere at SPACE is always friendly and fun, both the fellow exhibitors and the people who came by my table couldn’t have been nicer. Bob Corby is the wonderful host and creator of SPACE! So keep checking in to see reviews! 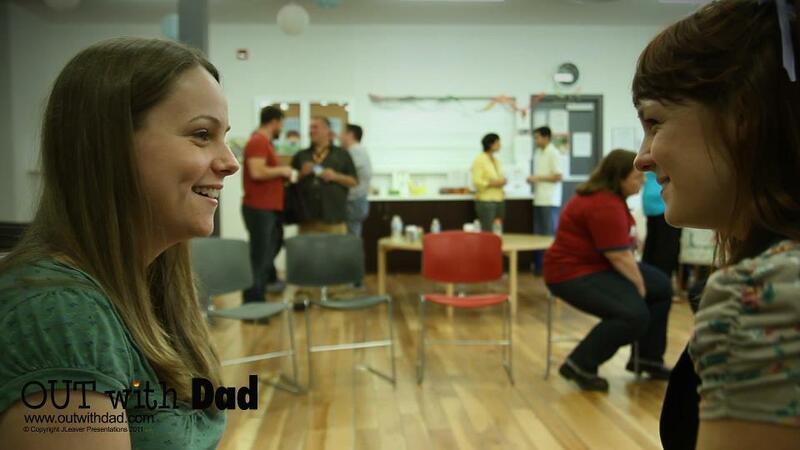 On another topic, my next blog entry here simply has to be a review of episode 2.08 of Out With Dad! I figured I could finish my SPACE Anthology posts and then get an Out With Dad review done before episode 2.09 was released. But Jason Leaver went ahead and released a new mini episode early! Now I’m behind schedule! Jason should consult with me before he does these things! Anyway, I should have that review up in a day or two! This is the second and final part of my review of the SPACE Anthology, available as a free download here. A story of a…hmmm…that’s giving too much away. 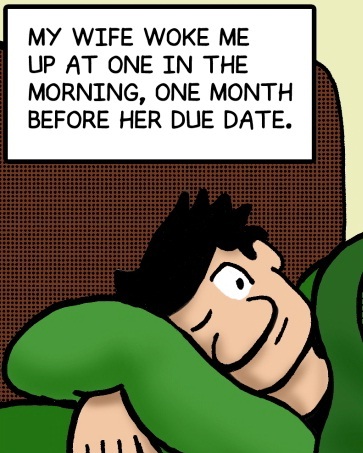 I’ll just say this is a neat little comic with humorous, surprising little twists. Well rendered and well told, also! I’m a bit disappointed…that Kel only did two pages for the SPACE Anthology! His Cornelia character is kinda a strange girl who always seems to get in trouble. Sometimes her fault, sometimes not. Be sure to check out his website for lots more laughs! Ah, the things people say in bed! This story sums it all up nicely in two pages! In a blue hue, but I’m not sure why! Blair Kitchen’s art reminds me of a Mad Magazine humorous style. His Possum character is a nerdy kid who cannot be killed due a zombifying tic tac. Really! Go to his website and read some Possum! It’s really good stuff! The one thing I don’t like about Kelly & Antal’s strip is that the “cover art” is much different from the art in the story. But this little tale about a zombie-fighting mystery man called the Night Watchmen is well told. The interplay between the two leads is very good. The philosophical narration I liked less, but it does set a tone. 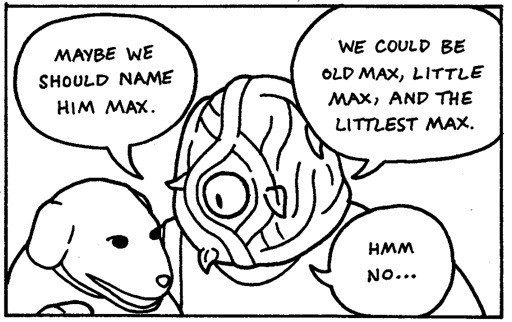 Max is an alien plant in the shape of a man traveling with a man called “Old Max” and a dog with no name. This tale is of their encounter with a broken down bus. It reminds me of some of the little tales in Paul Chadwick’s Concrete series. Great character interaction!! Perhaps my favorite story in the book! I laughed. I think you will too. The SPACE Anthology is a collection of comic stories by small press comic creators that are attendees of the Small Press and Alternative Comics Exposition (SPACE convention). The Anthology is available as a free PDF download here and will also be available in print form at the SPACE convention. I have set upon myself the task of reviewing the comics contained within the SPACE Anthology 2012. There are a large variety of strips, so anyone should eb able to find something they like. Then, you can follow up with these creators to get more information and more comics from them!! Iris is an interesting combination of whimsical artwork and a serious story. The story is about a man who’s wife has gone into early labor, and the consequences thereof, including having a premature, fragile child. It’s a very sentimental story that is very emotional for such a short page count (6 pages) and it’s something I can empathize with. I’m not familiar with John’s work, but I really like the look of this comic. This comic, on the other hand, sound like it would be sentimental, but is in fact a more philosophical account of the fate of mankind. Well…that’s not really true, either. It’s really a very PG-13 set up for a punch line I won’t spoil. I thought it was rather clever, if brunt. Cowboy is a whimsical story about death. Really. It has scratchy, black and white art and the lettering is a bit hard to read at times, but that is typical of traditional small press comics. If you like such things, you’ll enjoy this little story and its nice little ending. Whatever tales advatage of the color format of the SPACE Anthology by utilizing simple, colored pencil art. It looks to be a set up for a nice comic about single Mr. Bear, but I was disappointed in the abrupt ending. I own a lot of Bob Corby’s work. In addition to running SPACE, he’s a very talented cartoonist and his Vugz short shows he hasn’t lost his edge. Vugz is a little alien guy trying to take over the world. And he’s funny. If (like me) you love Haryy Potter and (like me) you love Star Wars, or if you know someone (like me) who does, you’ll get this comic. If not, I feel sorry for you…. Is a rather philosophical poem with little pictures that help with the meaning. It’s neat. Dragon’s Breath is a well-told and well-drawn story about a difficult, tragic situation. It’s about a girl’s memories of the Grandfather and how those memories do not reflect the true person he was. Mostly I thought it sad. I applaud Mari on her storytelling here. Very well done! I have Spy Guy #1, and I love the artwork of Mike Kitchen. His work is a very neat combination of reality and absurdity. His work has a very crisp, clean look. This short tale is about the obsession some people have with modern technology. I can relate! Definitely! Is my story. I’m not going to review it, so it’s a good place to stop today. I still have 9 more comics to go, so I’ll continue as soon as I can! Premiering at SPACE this year! This is it! The most shocking development ever for John Chisolm and his friends! It’s the twist you never could have predicted! Could this be the beginning of the end for the F.E.D.s??? 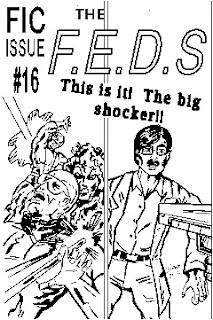 The Federation of Extra-normal Defenders #16 is a comic I’ve been waiting to make ever since I began the F.E.D.s back in 1999! This is the type of story that can only work if there is a build-up over time, and the time for this story has finally come! My overall plot for the F.E.D.s was determined before I began writing issue #1, though little details needed to be fleshed out. This issue is one of those big turning points in a story that was planned from the start! I hope it satisfies and surprises those who read the book. If you aren’t coming to SPACE this year you can still order the book directly from me via e-mail for $1 plus shipping and/or trades are welcome!